We had a great weekend trip to St. Louis. Mike has been an Atlanta Braves fan for many years and I thought it would be nice for him to see Chipper play in person one more time in his last season. We decided it would be better to drive to St. Louis than Atlanta. Mother's Day weekend was our only choice. The kids were really good for the 12 hours we were in the car. I was pleasantly surprised. We loved our hotel. 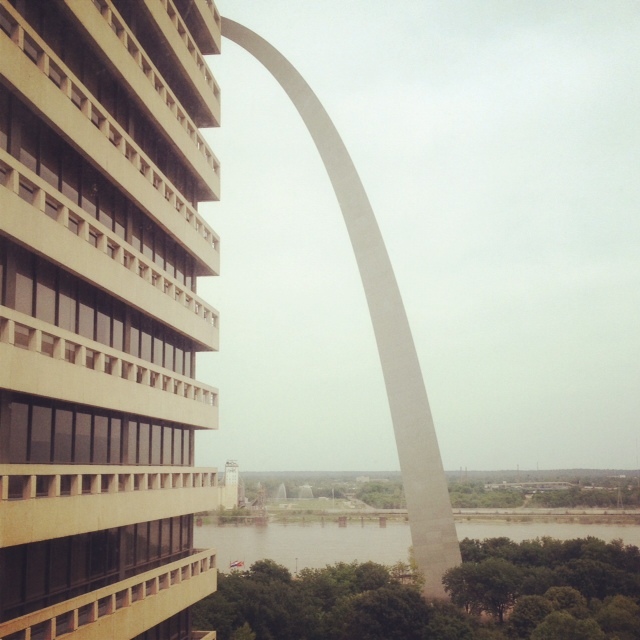 We stayed at the Drury Inn at the Arch. It was full of baseball fans, mainly cardinals, but everyone was friendly. Here's the view from our room. I was very impressed by how classy Cardinals fans are. We received no dirty looks or snide remarks as we went around with our Braves garb. 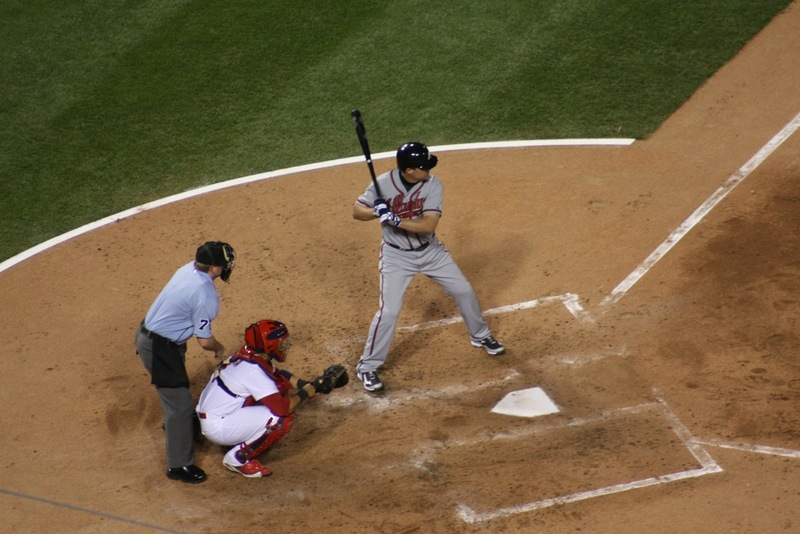 When Chipper stepped up to bat the first time, the entire stadium rose to their feet and gave him a standing ovation. I thought that was something else! 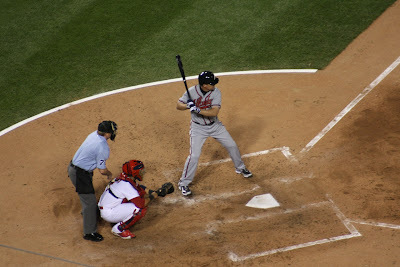 The cards catcher even called time so Chipper could enjoy the moment. Here he is at bat. Busch stadium is gorgeous. 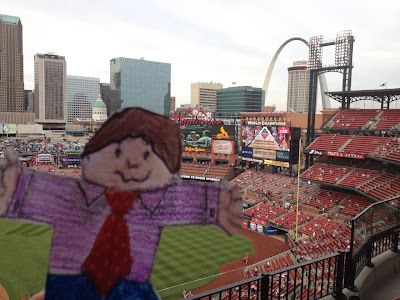 Addie's friend Caleb in Oklahoma, is doing a Flat Stanley project and he sent Stanley to her and asked her to take pictures of him somewhere interesting, write about it, and send it back. 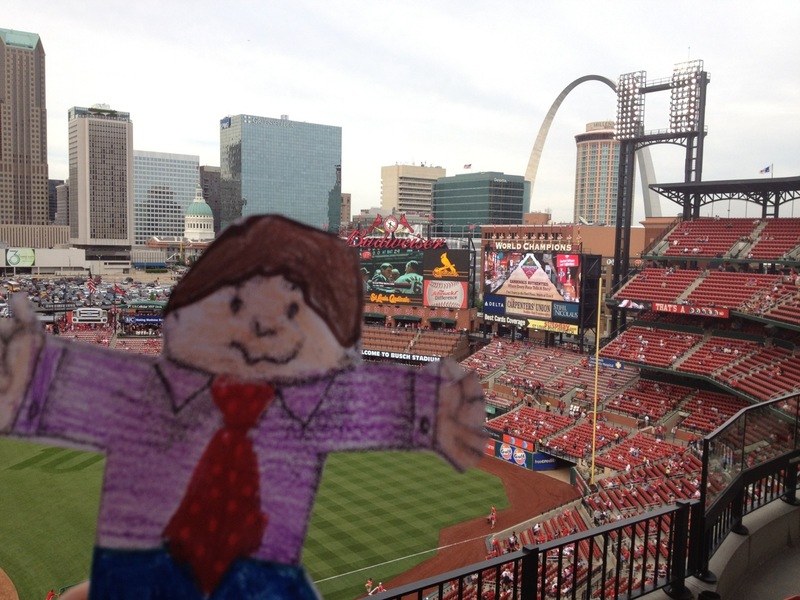 So Flat Stanley came with us. She had a great time with that! Saturday, the girls and Mike went up inside the Arch. Not me! I kept my feet firmly planted. Then we went to the zoo and did a lot of walking! I wore the wrong shoes and had very sore feet. Later, the girls swam in the hotel pool, then we went to the City Museum. 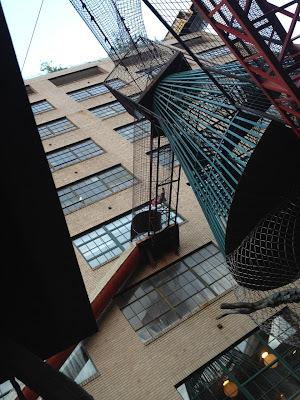 It was a very cool place with tubes, coils, and tunnels for kids to crawl through. The girls had a blast, but I had a major anxiety attack because I couldn't find Caroline. There was no way to follow them through all those small spaces. I knew deep down there was only one exit and she hadn't gone out of it, but I just couldn't stand not being able to see her! So I would definitely recommend this for older kids! Here she is climbing in one of the outdoor tunnels. Oh, and here is a neat photo Mike took of an elephant. 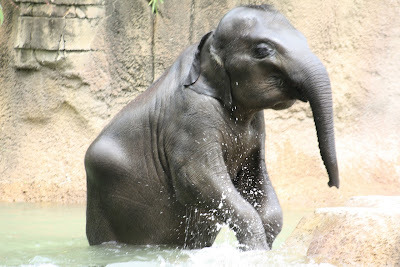 I've never seen an elephant playing in the water at a zoo before! St. Louis is definitely a great place for families. There were many things we would have liked to do, but didn't have time. We can't wait to go back! Remember well visiting Grandpa and Grandma Nona growing up and going to the Zoo and Arch. When Dustin was 13 we took him to see the Cardinals play. Fun Times!